THIS SHOW HAS BEEN MOVED TO THE GOV. ALL MOSHTIX TICKETS WILL BE VALID AT THE NEW VENUE. Celebrating twenty years since their formation back in 1999, American alt-rock/emo heroes TAKING BACK SUNDAY are hitting the road showcasing their prolific recording career performing select double album plays, including their iconic debut "Tell All Your Friends", sophomore smash hit "Where You Want To Be" and fan favourite "Louder Now" along with a couple of other favourites and quite possibly a new song or two in Adelaide, Melbourne, Sydney and Brisbane this January. Tickets for all shows go on sale at 10am Monday, October 15. My Live Nation members can secure tickets first during the exclusive pre-sale beginning 10am Friday, October 12 until 5pm Sunday, October 14. If you can't believe that Taking Back Sunday have been around for 20 years, you're not alone, because they can't either. Although the pride of Long Island have had a handful of member changes over the years, the current line-up of the band - vocalist Adam Lazzara, guitarist John Nolan, drummer Mark O'Connell and bassist Shaun Cooper - have all been there since the beginning. From the band's landmark 2002 debut "Tell All Your Friends" to their most recent full-length, 2016's "Tidal Wave", Taking Back Sunday have evolved from a key player in the early 2000s emo scene to a genre-defying rock band who have three gold albums without ever ceasing to push the limitations of their sound. This fact is evidenced on "Twenty", a 21-song collection set for release in January 2019 via Craft Recordings that spans all seven of their full-lengths and solidifies them as an act with a catalogue that will undoubtedly outlive them. Taking Back Sunday may have started out like most of their peers by playing local shows and recording demos; however, unlike most of those peers they went on to sign to a major label, tour alongside Linkin Park and become international superstars. That said, they still speak of the band's early days as if they just happened yesterday. "I'll never forget, we played Ground Zero in Long Island in 2001 and it was the first show we played where people were singing along and going crazy. It was a tiny place that held 100 people but you could sense something had changed," Lazzara recalls. "After the show I remember we carried some equipment back to John's car and we were sitting in it just not saying anything. We were just thinking, 'that was the best thing ever.' I was starry eyed and staring into space; I couldn't believe that just happened." Nolan concurs, adding, "Even after the band got a lot bigger and did things that were a lot more impressive, that moment was really huge because you could tell something was happening. Everyone was going nuts and that really stands out to me as being one of the defining moments of Taking Back Sunday." This twenty-year anniversary tour is a celebration not only of those career-defining moments but of the landmark albums that chronicle the band's story: 2002's "Tell All Your Friends", 2004's "Where You Want To Be", 2006's "Louder Now". Whether your introduction to the band was singing along to 'A Decade Under The Influence' in a sweaty club or hearing 'MakeDamnSure' or 'Sink Into Me' on the radio, the band's long awaited return to Australian shores is sure to be a look back at some of the highlights from this unlikely group of musical misfits. 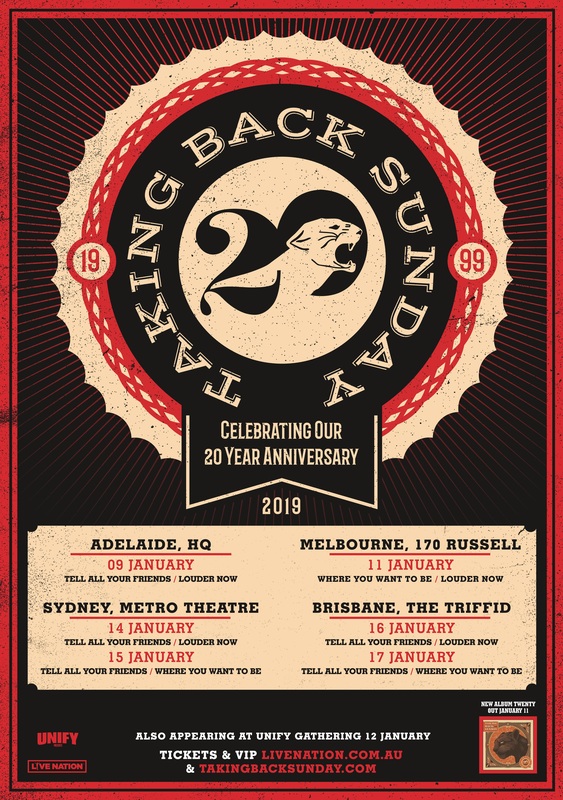 Musical legacy aside, what's most impressive is the fact that after two decades and countless successes, Taking Back Sunday have managed to preserve that initial spark that excited them as teenagers. That fact alone is one worth celebrating, so don't miss out on experiencing these moments of nostalgia - live and loud! NEW ALBUM "TWENTY" OUT JANUARY 11, 2019 WITH 2 NEW SONGS!